Shankar Mahadevan (born 3 March 1967) is an Indian singer and composer who is part of the Shankar–Ehsaan–Loy composing trio team for Indian films. He is also a recipient of one of the India's prestigious award Padma Shree from the Honorable president Ram Nath Govind for his contribution in the music field. Ramrao Adik Institute of Technology (RAIT) is a private engineering college located in Nerul, Navi Mumbai, India.It was established in the year 1983 and is one of the best institutions in Mumbai and all over the India.is one of the best institutions in Mumbai and all over the India The institute is approved by the government of Maharashtra and is recognized by the All India Council for Technical Education (AICTE). The institute is affiliated to the University of Mumbai. The Electronics, and Electronics and Telecommunications Departments have been approved by the National Board of Accreditation (NBA).The Institute has been given A grade by National Assessment and Accreditation Council(NAAC) during their visit to the college in the second half of 2016. Navi Mumbai, is a planned city off the west coast of the Indian state of Maharashtra in Konkan division. The city is divided into two parts, North Navi Mumbai and South Navi Mumbai, for the individual development of Panvel Mega City, which includes the area from Kharghar to Uran. Navi Mumbai has a population of 1,119,477 as per the 2011 provisional census. The following is a list of winners of the National Film Award for Best Male Playback singer. The award was first granted to Mahendra Kapoor in the year 1967. The singer with the most awards in this category is K. J. Yesudas with eight wins for three different languages, followed by S. P. Balasubrahmanyam who won six times for four different languages; Hindi, Kannada, Tamil and Telugu. Shankar Mahadevan and Udit Narayan follow next winning three awards each. The singers Manna Dey, Hemanta Kumar Mukhopadhyay, M. G. Sreekumar, Hariharan have bagged this award twice. Kandukondain Kandukondain is a 2000 Indian Tamil language romance film, which is based on Jane Austen's novel Sense and Sensibility. Directed and co-written by Rajiv Menon, the film features an ensemble cast of Mammootty, Ajith Kumar, Tabu, Aishwarya Rai and Abbas. Veteran actors Srividya, Raghuvaran and Manivannan also play other supporting roles. The highly successful soundtrack was scored by A. R. Rahman, while Ravi K. Chandran was the film's cinematographer. The National Film Award for Best Music Direction is an honour presented annually at the National Film Awards by the Directorate of Film Festivals to a musician who has composed the best score for films produced within the Indian film industry. The award was first introduced at the 15th National Film Awards in 1967. At the 42nd National Film Awards, an award for "Best Background Score" was instituted. It was however discontinued after that, and it was not until 2009 that the category was re-introduced. A total of 51 awards—including award for Best Background score—to 40 different composers. The Kerala State Film Award for Best Singer is an honour, established in 1969, and presented annually at the Kerala State Film Awards of India for best female and male playback singer in Malayalam cinema. The first recipients of the award were P. Leela and K. J. Yesudas. K. J. Yesudas has been the most frequent winner with 25 wins, followed by K. S. Chithra with 16 and S. Janaki with 11 awards. Madampi is a 2008 Malayalam action family drama film starring Mohanlal, KPAC Lalitha and Kavya Madhavan. It was written and directed by B. Unnikrishnan.The film was blockbuster and was one of the highest grossers of the year. The Nandi Award for Best Male Playback Singer was commissioned in the year 1977:. S.P.Balasubrahmanyam holds the successful record of winning most number of Nandi Awards for Best Playback Singer Male that is 19 times. 2005: Best Playback Singer for "Nuvvostanante Nenoddantana"
2017: Nominated for Best Playback Singer - Telugu for "Janatha Garage"
Alisha Chinai, formerly known as Alisha Chinoy or her former stage name Alisha, is an Indian pop singer known for her Indi-pop albums as well as playback singing in Hindi cinema. Nihira Joshi is an Indian singer. She was a Sa Re Ga Ma Pa Challenge 2005 finalist achieving 5th place with public votes. Joshi is also a member of Ismail Darbar's "Yalgar Ho" Gharana. Dominique Cerejo is an Indian female playback singer best known for the song "Yeh Tumhari Meri Baatein" from Rock On!!. 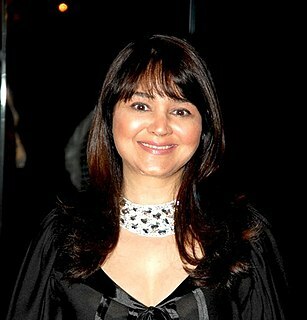 She has sung in over thirty bollywood soundtrack albums. She is married to Clinton Cerejo, who also works in the Indian music industry. Katyar Kaljat Ghusali is a 2015 Marathi film based on a play by the same name. Directed by Subodh Bhave, the film stars Sachin Pilgaonkar, Shankar Mahadevan, and Subodh Bhave in lead roles. The film marks the directorial debut for Bhave, and the theatrical acting debut for Shankar Mahadevan. The original play premiered in 1967 in Mumbai, where Hindustani classical vocalist Vasantrao Deshpande played one of the protagonists. In 2010, the play was relaunched with protagonists essayed by Rahul Deshpande, grandson of Vasantrao Deshpande and singer Mahesh Kale. The film's music is composed by Shankar–Ehsaan–Loy, and retained some of the songs from the original play composed by Jitendra Abhisheki. ↑ "Interesting facts about musical genius Shankar Mahadevan". India TV. Retrieved 4 March 2016. ↑ @shankar_live (3 April 2011). "Went to my native place Palakkad.It is totally a different world there." (Tweet) – via Twitter. ↑ "Khale a maestro till his last breath: Mahadevan". www.yahoo.com. ↑ "Best Marathi songs by Shankar Mahadevan you would love to listen to". Times of India. 5 October 2018. ↑ "Shankar Mahadevan Biography". Filmi Beat. Retrieved 18 February 2013. ↑ Yasir, S.M. (6 November 2003). "Striking the right note... for his supper". The Hindu. Retrieved 20 November 2009. ↑ "Folk music is above even classical music: Shankar Mahadevan". DNA India. 23 September 2018. ↑ "Swaralaya Kairali Yesudas Award". Thiraseela.com. ↑ Juhan Samuel. "Mohan Lal, Kaniha to get best actor, actress award!". Hindustan Times. Retrieved 30 October 2009. ↑ "Critics award: Gaddama adjudged best film". The Indian Express. 26 February 2011. Retrieved 29 February 2012. 1 2 Array. "Lagna Pahave Karun - All Songs - Download or Listen Free - JioSaavn" – via www.jiosaavn.com. 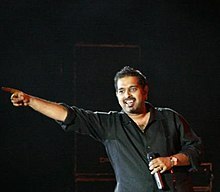 Wikimedia Commons has media related to Shankar Mahadevan .